This is part one of a series of articles Kitty S Jones is writing about propaganda techniques, with the aim of explaining the seven main types that The Institute for Propaganda Analysis identified in 1938, and looking at current examples of their use. Propaganda techniques are still very commonly used in the media, in advertising, in politics and in debate. In the US, much of the work by the Institute of Propaganda Analysis tended to focus on the techniques of persuasion used by Stalin and Hitler. Many people think that there is no need for research nowadays, but propaganda techniques are still being used widely. In present day Britain, the government has adopted a psychocratic approach, reflected in public policies that have a central aim of “behavioural change” and are founded on quasi-scientific understandings of the basis of human decision-making. The Conservatives claim to champion the small-state and minimal intervention, yet the consequences of their policies insidiously intrude into people’s everyday experiences and thoughts. Our attitudes and beliefs are being manipulated, our decision-making is being “nudged,” citizens are being micro-managed and policed by the state. 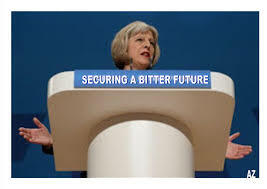 The Conservatives use Orwellian-styled rhetoric crowded with words like “market forces”, “meritocracy” “autonomy”, “incentivisation”, “democracy”, “efficient, small state”, and even “freedom”, whilst all the time they are actually extending a brutal, bullying, extremely manipulative, all-pervasive state authoritarianism. Furthermore, this authoritarianism entails a mediacratic branch of government that powerfully manipulates public opinion. The mind-numbing mainstream media is conformative rather than informative, and is designed to manufacture and manage public consensus, whilst setting agendas for what ought to be deemed important issues. The media is scripting events rather than simply reporting them, and filtering information by deciding which events may and may not have precedence. “Everything within the state, nothing outside the state, nothing against the state.” Benito Mussolini. The current government is not interested in any form of democratic dialogue. They simply want to set a rigid agenda to control socio-political outcomes to benefit the powerful and wealthy elite. We are witnessing attempts to control virtually all aspects of social life, including the economy, education, private life, morals and the beliefs and attitudes of citizens. We are also seeing the rise of political behaviourism, which is closely linked with totalitarian forms of thinking. “The officially proclaimed ideology penetrates into the deepest reaches of societal structure and the totalitarian government seeks to completely control the thoughts and actions of its citizens.” Richard Pipes. Recent public policies related to behavioural change exploit the emotive, automatic drivers of decision-making through methods such as subconscious priming or default settings. This is extremely worrying, as it bypasses rational processes, and has some serious implications for conceptions of human autonomy and agency, which is central to the design of liberal democracies. Democracy is based on a process of dialogue between the public and government, ensuring that the public are represented: that governments are responsive, shaping policies that address identified social needs. However, Conservative policies are no longer about reflecting citizen’s needs: they are increasingly all about telling us how to be. We do need to expose and challenge such insidious, anti-democratic state control freakery and psychocratic shenanigans. Part 1. Glittering Generalities: all that glitters is glib, not gold. Glittering Generalities is one category of the seven main propaganda techniques identified by the Institute for Propaganda Analysis in 1938. It’s a device often used by the media and in political rhetoric to persuade us to approve and accept something without examining the evidence. This is a propaganda technique that is purposefully designed to divert and distract, so that people are less likely to develop their own critical thoughts. This said, the purpose of all forms of propaganda is to tell you what to think, and not how to think. Glittering Generalities capitalise on increasingly sloganised political discourses, leading to a loss of conceptual clarity, over-idealisation and they also reflect conceptual miserliness – a tendency for some people to prefer simple, superficial and easy answers, rather than having to expend time and effort to grapple with complexity, critical analysis and the need to weigh up evidence. Gordon Allport’s Principle of Least Effort is a theory that humans engage in economically prudent thought processes, taking “short-cuts” instead of acting like “naive scientists” who rationally investigate, weigh evidence, costs and benefits, test hypotheses, and update their expectations based upon the results of the “experiments” that are a part of our everyday actions. Sometimes we are more inclined to act as cognitive misers, using mental short-cuts to make assessments and decisions, concerning issues and ideas about which we know very little, as well as issues of great salience. The term “Cognitive Miser” was coined by Fiske and Taylor (in 1984) to refer, like Allport, to the general idea that individuals frequently rely on simple and time efficient strategies when evaluating information and making decisions. Rather than rationally and objectively evaluating new information, the cognitive miser assigns new information to categories that are easy to process mentally. These categories arise from prior information, including schemas, scripts and other knowledge structures, such as stereotypes, that have been stored in our memory. The cognitive miser tends not to extend much beyond established belief when considering new information. This of course may perpetuate prejudices and cognitive biases. Glittering Generalities imply – or signpost us – via common stock phrases to our own tacit knowledge, which often lies below our current focal awareness – prior information, beliefs, ideals, values, schemata and mental models, stereotypes and so on, creating the impression that the person using the terms and phrases understands and sees the world as you do, creating a false sense of rapport by doing so. Or the feeling that some very important recognition has been made. Glittering Generalities is a technique very often used by people who seek to stifle debate, sidestep accountability and suppress democratic processes. Because Glittering Generalities tend to obscure or gloss over serious areas of disagreement, they hide controversy and submerge alternative propositions. As such, Glittering Generalities may often used to neutralise opposition to dominant ideas. It’s a way of disguising partisanship and of manipulating and reducing democratic choices. It’s nothing less than a political micro-management of your beliefs and decision-making. It also reduces public expectation of opposition and in doing so it contributes to establishing diktats: it’s a way of mandating acceptance of ideology, policies or laws by presenting them as if they are the only viable alternative. This propaganda technique bypasses rationality altogether, by employing morally laden or emotionally appealing words and phrases so closely associated with highly valued concepts and beliefs that carry conviction – convince us – without need for enquiry, supporting information or reason. The meanings of such words and phrases is generally based on a loose, tacit public consensus, often varying between groups and individuals. Semantic shift describes a process of how the meanings of words may change over time, but meanings also shift and vary amongst social groups. Language is elusive and changeable. (Words like wicked and bad, for example, shifted sub-culturally. Originally: evil, corrupt, sinful, malevolent → superb, excellent, great, fantastic. ) Let’s not forget that when we use language, it is with purpose and intent. So, Glittering Generalities are rather like platitudes or clichés presented as semantic signs to cognitive short-cuts that are often used to distract and placate people, they provide a superficial, broad, symbolic map to a logical cul-de-sac. They are superficially appealing and convincing but empty, meaningless words or phrases. Use of attractive, but vague “virtue” words that make speeches and other communications sound good, but in practice say nothing in particular. Use of lulling linguistic patterns such as alliteration, metaphor and reversals that turn your words into easy to remember soundbites that often flow and rhyme in hypnotic patterns. Use of words that appeal to morals and values, which often themselves are related to triggering of powerful emotions. A common element of glittering generalities are intangible nouns that embody ideals, such as freedom, democracy, integrity, justice, respect. Some further examples of Glittering Generalities are: economic plan, making work pay, all in it together, big society, freedom, family values, the common good, democracy, principles, choice, incentivise, efficiency, fairness, hard-working families, parental choice, a caring society, fiscal responsibility, market choice, meritocracy, personal responsibility, making work pay, scroungers and strivers, anti-austerity, socialism, progressive, disenfranchised, deceit, Westminster establishment, the needs of the people, but that’s all just semantics really. A good example of a Glittering Generality is the Conservative’s phrase “making work pay.” It refers to the Tory welfare “reforms” which were nothing to do with the level of wages. How does reducing benefits for unemployed people actually make work pay? Especially given the fact that wages have dropped for those in work, at the same time, the cost of living has risen, and consequently many working people are now living in poverty. The question to ask is: making work pay for whom? The Tories have an Orwellian dexterity in manipulating semantic shifts. They do like to dress-up words and parade them as something else. For example, take the word “reform,” which usually means to make changes to an institution, policy or practice in order to improve it. The welfare “reforms” have involved the steep and steady reduction of welfare provision and an increase in political scapegoating and victim-blame narratives. We have also seen the return of absolute poverty since the “reforms” were (undemocratically) implemented in 2012, which can hardly be considered as an “improvement” to what came before the Tories made savage and brutal cuts to poor people’s lifeline benefits, making them even poorer, with some people dying as a consequence. Then there is the Tory drift on the word “fair.” It’s generally taken to mean treating people equally without favouritism or discrimination, and without cheating or trying to achieve unjust advantage. However, the Conservatives have repeatedly claimed that cutting people’s lifeline benefits is “fair.” As I’ve previously stated, the value of wages has also dropped, the cost of living has risen and many in low paid work are now living in poverty, in reality the welfare cuts have simply made people desperate enough to take any low paid work, which does not alleviate circumstances of poverty. Furthermore, how can the welfare cuts be regarded as remotely fair, when they took place in a context where the government handed out £107,000 of public funds to each millionaire, in the form of an annual tax break? Finally, it’s not only the Tories that utilise propaganda techniques, and some parties on the Left have also used Glittering Generalities. These parties especially capitalized on the public’s growing cynicism and dissatisfaction with the “Westminster establishment.” UKIP and the Scottish National Party drew on nationalism (and independence,) whilst using superficial, simplistic and ambiguous phrases and symbols, the Green Party and other Left-wing factions also drew on public dissatisfaction with “mainstream parties” and appealed to people’s hopes and fears to present an “alternative.” Both the Greens and the Scottish nationalists presented a rhetoric skillfully tailored and laden with words and phrases that reflect progressive ideals whilst also claiming a position that opposed austerity. Yet this lacked integrity, as the rhetoric wasn’t fully connected to actual manifesto policies. Crucially, the Scottish National Party’s spending plans implied deeper cuts than Labour’s plans entailed over the next five years, as the Institute for Fiscal Studies (IFS) said in a report in April, highlighting, as the report said, a “considerable disconnect” between the nationalist’s rhetoric on austerity and their policies. The Green Party had a similar disconnect between an anti-austerity rhetoric and their incompatable policy proposals of a zero-growth economy and the universal citizen’s income. The latter was heavily criticised because, as it was modelled, the universal basic income would create deeper poverty for the poorest citizens and extend further social inequality. The Labour Party ran a rational but superficially less appealing campaign based on the material conditions of society. The policy plans for an extensively redistributive tax system, for example, matched the rhetoric about addressing growing social inequality, as well as a social reality. This entry was posted in Government policy, Propaganda and tagged Propaganda, propaganda analysis by adminthinkleft. Bookmark the permalink. Exvellent post. Reblogged . Merci left.